Next time we’ll bring snowboards and deckchairs. My friend Tom and I had been planning a trip to the Tetrahedron for about 10 years. This weekend we finally did it. In hindsight, hiking to Mount Steele cabin would have been easier when I was 36, not 46. At the base of 5,114-foot Mount Steele, the cabin is one of four two-storey cabins in Tetrahedron Provincial Park, each built to accommodate 16 people – first come, first serve. 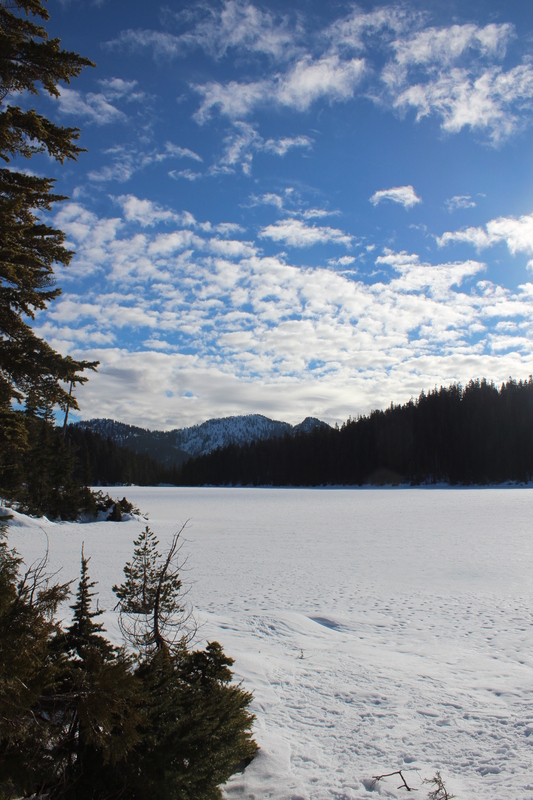 The others are at Bachelor Lake, above Edwards Lake, and between McNair and Chapman Lakes. The cabins are connected via a 25-kilometre trail network and are maintained by the Tetrahedron Outdoor Club. Lower Mainlanders enjoying lunch at Edwards Cabin. We set off on snowshoes from the trailhead up Grey Creek Forest Service Road. In true Sunshine Coast fashion, the Tetrahedron is not signposted from the road, despite being a Class A provincial park. That might explain why there are only three other cars in the parking lot on a sunny January weekend. Six thousand hectares of mountains, lakes, streams, wetlands and forest, the Tet, as it’s fondly known, has long been cherished by the backcountry enthusiasts who can actually find it. We finally meet some of those enthusiasts about two hours into our hike at Edwards Lake. 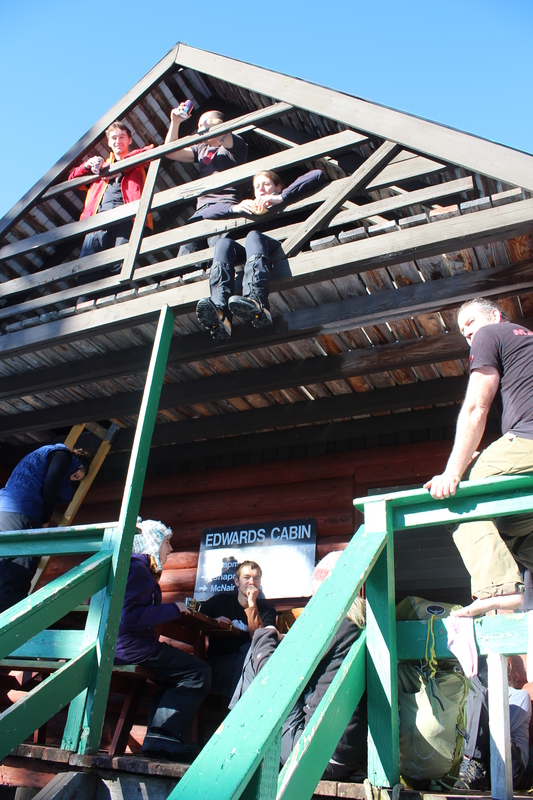 They’re a group of 12 skiers and snowshoers from the Lower Mainland who are planning to stay at Edwards Cabin. We stop for lunch with them there before pushing on at 1 p.m. So far we’ve been hiking for about two hours. There’s been no new snow for a week, temperatures are above freezing and the sun’s out. The sign at Edwards Cabin says it’s just three more kilometres to Mount Steele Cabin. It doesn’t mention the elevation gain of 1,300 feet, but that much is obvious from the contour lines on Tom’s map, which look like an intense low pressure system; that and our occasional glimpses of Mount Steele – white, jagged and way up there beneath the bright blue sky. Downtime at Edwards Lake. We opted not to test the ice. I don’t say anything. I’ve stopped talking to Tom. So we descend, covering the same distance in 10 minutes that took us 30 minutes to climb. It’s 3:30 p.m. and for the first time all day, I have one eye on the time. The sweat is freezing on my back and it will be dark in 90 minutes. After some searching though, Tom spots a marker and we’re off again, climbing in a different direction toward a ridge that he swears will take us to the cabin. From the ridge we’re treated to views of the Tantalus Range and the markers continue to guide our way. 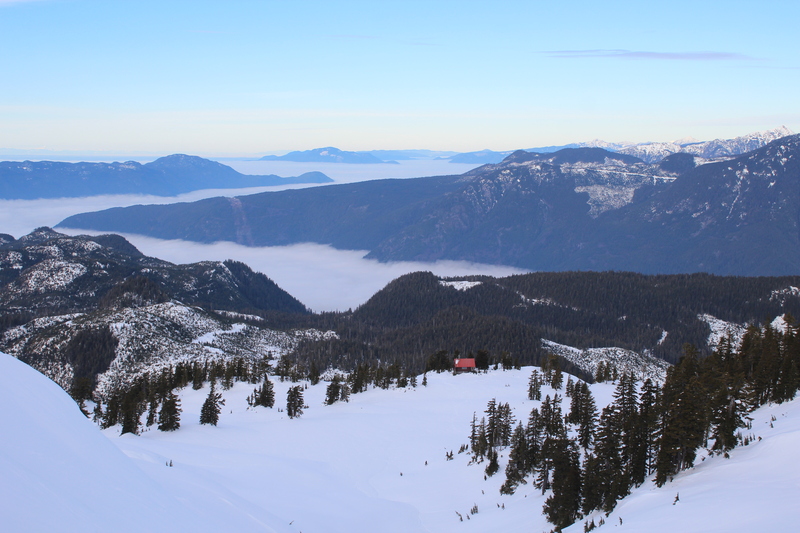 Mount Steele cabin, as seen from the top of Mount Steele. Thank God he’s not lying, I think as I catch up a few minutes later. There it is, its red roof standing out against so much white. We savour the last few steps. I don’t think I’ve ever seen a location quite so beautiful. We have the place to ourselves. According to the guest book, we’re only the second visitors this year. 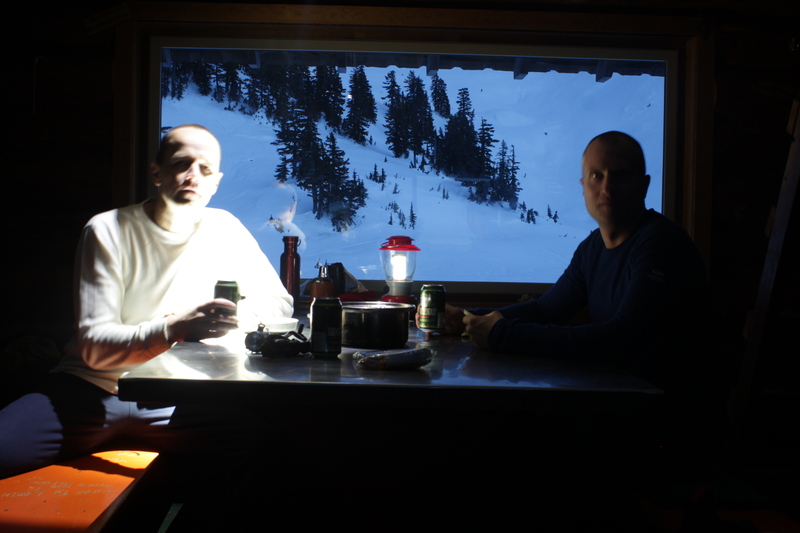 An hour later at the metal kitchen table, we’re eating curry and naam bread cooked on the wood stove, washed down with a couple of beers. The cabin is well equipped, with mattresses in the attic, firewood in the basement, a kitchen counter with utensils and a couple of sinks. We melt snow for water and turn the stove down to a slow burn. Pretty soon the entire cabin is toasty warm. It would seem impossible to put a price on such an amazing place, but the Tetrahedron Outdoor Club came up with $10 a night, which seems more than reasonable. More than a quarter of a century ago, the club used to be known as the Tetrahedron Ski Club. Back in 1987, the club mobilized more than 200 volunteers, 45 businesses, schools, community groups and several levels of government to build the Tetrahedron’s cabins and trail network. Beer, curry, mates – just another Saturday night. The cabins were built at Sechelt airport before being disassembled and flown by helicopter to be reassembled on site. Forestry company, Canfor, and the Sunshine Coast Regional District donated timber, Sechelt Creek Contracting provided logging service, Airspan donated some air time, Gibsons Building Supplies provided crane trucks and the Outdoor Recreation Council pitched in with chainsaws. For one of the few times in Sunshine Coast history, one great idea united governments, businesses, and local volunteers – in the midst of a recession, no less. For all the day’s exertions, I can’t sleep. 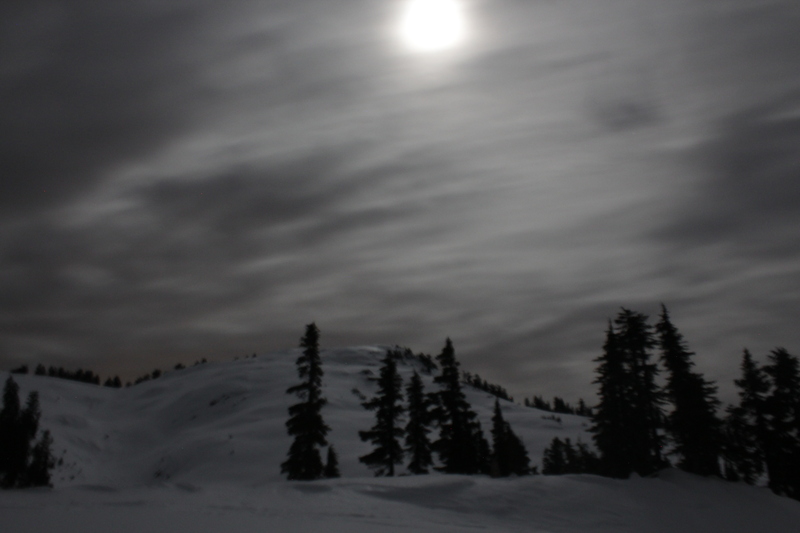 After midnight I set up my tripod outside and try and capture Mount Steele by moonlight with varying results. Fog covers Georgia Strait but I can see lights twinkling on Vancouver Island. There’s no bite to the breeze blowing and I feel like the last person on Earth. I may be delusional. I go back to bed. The moon over Mount Steele. Sometimes not sleeping isn’t so bad. In the morning under clear skies we hike to the top of Mount Steele. It’s difficult to reconcile this rugged terrain and such epic landscapes with the place I call home. For me, the Sunshine Coast typically conjures images of rainforest and beaches, not jagged peaks and frozen lakes. But then visiting this place would surely alter anyone’s perceptions. Tom vows to bring his snowboard next time. I’m thinking a deck chair. We pack up, sweep up, and head out for the descent to civilization. Yesterday, it took us six hours to get here. Today we’re back at the car in just over two hours. I relish every step of our tracks with a smile. For more on the history of the Tetrahedron Outdoor Club, visit my earlier blog post here. 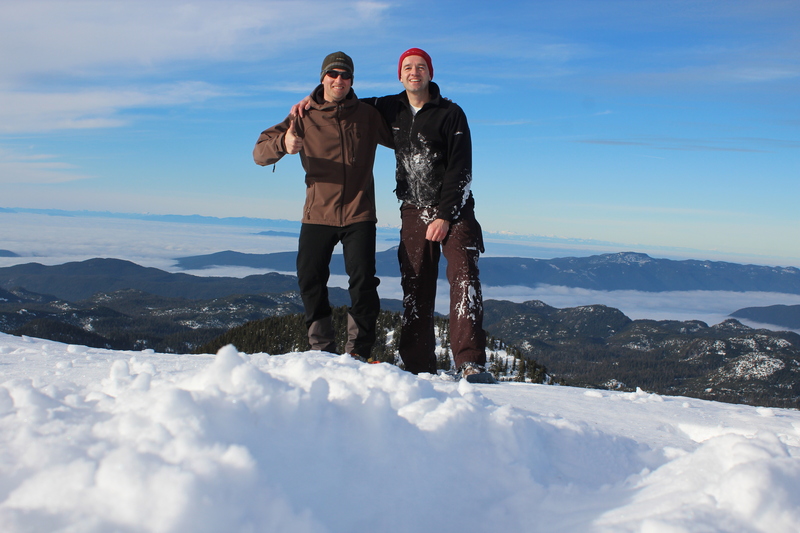 If your fitness is kind of sketchy and you’re inexperienced in the backcountry, consider taking Tom with you. I couldn’t have done it without him.